Internet Explorer (IE) provides many options that you can configure to customize your browsing security. IE divides security into four zones: Internet, Local Intranet, Trusted Sites, and Restricted Sites. You can configure the security for each zone individually. 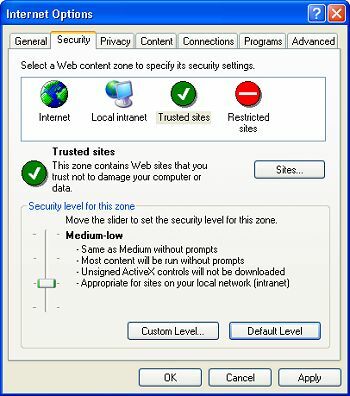 IE tracks which zone you are accessing and sets the security accordingly. To access these configurations select Tools | Internet Options... in IE's main menu. In the Internet Options dialog box that appears, select the Security tab. On the Security tab, click on a "Web content zone" icon then on the [Default Level] button. A slider control will appear that allows you to quickly increase or decrease the security level for that zone. To set a detailed custom security for a zone, click on the [Custom Level ...] button. In the Security Settings dialog box that appears, you can set radio buttons to configure each individual security setting. 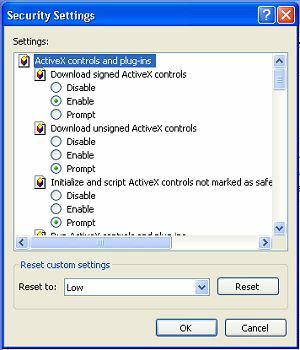 Most of the settings allow you to Disable, Enable, or Prompt a security feature.